JUSTICE Brassington Reynolds, the trial judge in the Ogle 4-man murder trial yesterday freed two of the four accused on no-case submissions. At the close of the prosecution’s case and following no-case submissions, the judge agreed with defence counsel Mr. Hukumchand and Mr. Adrian Thompson that there was no evidence against their clients Azim Khan, the number two accused and Kumar Seeraj called ‘Boysie’, the number four accused. The judge directed the jury to return a formal verdict of ‘not guilty’ in favour of the two men, who were later discharged and left the dock freed men. 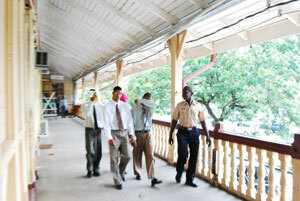 The four accused including the two freed yesterday are seen escorted by Policemen during the trial. The four defence counsel had completed their addresses to the judge in relation to the no-case submissions which took place in the absence of the jury. Prosecutor Mr. Ganesh Hira will deliver his address today in relation to the other two accused. Among other things, the judge ruled yesterday that the fingerprint evidence in the case was inadmissible and would be rejected from the evidence. This is a result of defence submissions to the effect that the witness who uplifted the fingerprints from the deceased’s car and mounted them on a card, admitted in evidence, that both he and his assistant had omitted to sign the card. The witness also could not say with certainty which officer he had asked to sign the document and was not in a position to recognize the signature. After calling his last witness, Radish Persaud, yesterday, leading Prosecutor Mr. Ganesh Hira, closed the case for the Prosecution. So far, four voir dire had been held. Following the smaller trials in the absence of the jury, six witnesses had testified at the substantive trial. The close of the prosecution case yesterday was followed by defence no-case submissions by the four defence counsels. The lawyers in the absence of the jury made submissions to the judge with the hope of convincing him that the prosecution had failed to make out a case to be sent to the jury, and that their clients should be freed at this stage. Addressing the Court in the following order, Mr. Adrian Thompson for number four accused, Kumar Seeraj called ‘Boysie’; Mr. Hukumchand for accused number two, Azim Khan; Mr. Euclin Gomes for accused number one, Christopher Dhanrad also called Paul Jagnandan; and Miss Kamini Parag for number three accused Vijay Rajkumar called ‘Eon’. 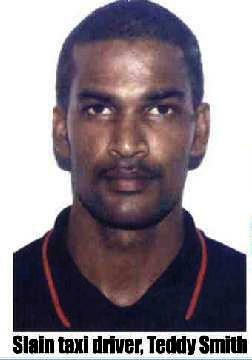 The accused are indicted for the murder of 33-year-old taxi driver Teddy Smith on the 24th day of October, 2004. A fifth accused – Daveanand Ganeshram who was charged jointly with the crime, was freed by the magistrate at the preliminary hearing. Leading Prosecutor, Mr. Ganesh Hira, who is associated with lawyers, Latchmie Rahamat and Rhondel Weever, will reply to the defence no-case submissions today, after which the judge is expected to rule in respect to the other two accused. On the resumption of the trial yesterday, Sgt. Radish Persaud of Sparendaam Police Station testified that he had taken a statement from one of the accused – Daveanand Ganeshram, who had been freed at the P.I. by the Magistrate. That statement, he said, was under caution. Under cross-examination, witness denied that he had beaten the accused Jagnandan and had threatened to break the fingers of Rajkumar if he did not sign a caution statement. The mixed jury in the Ogle murder trial heard that the four (4) accused had robbed and killed taxi driver Teddy Smith on the night of October 24, 2004. This allegation was contained in two alleged confession or caution statements said to be given to the police by accused Christopher Dhanrad called Paul Jagnandan and Vijay Rajkumar called ‘Eon’.